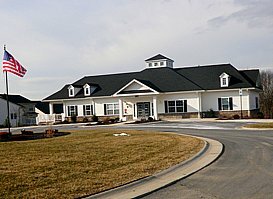 If you like rolling hills and peaceful country views, then retirement in the Frederick, Maryland, area may be for you. We visited the historic towns of New Market and Middletown in the rolling Maryland countryside. From Baltimore, it is a leisurely scenic drive on the back roads to Route 40. 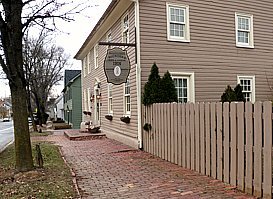 A drive along Route 40 between the 18th century towns of New Market, Frederick, Middletown, and Hagerstown is a nostalgic step back in time. 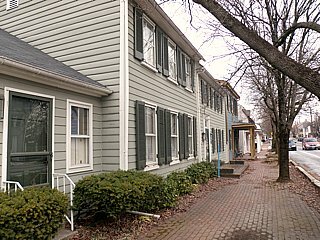 Though Frederick and Hagerstown have grown in size, other towns have remained small and quaint. 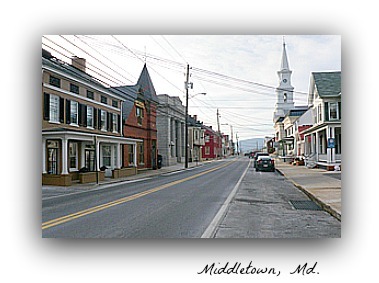 The town of Middletown was so named because it was in the middle between Frederick and Hagerstown. They existed before turnpikes or freeways and have maintained their character. There are two Frederick area communities we were anxious to see because this area is a hidden gem. Fresher air than city air, high open spaces, cows still grazing close to the road, and yesteryear's quiet. If these things appeal to you then retirement in the Frederick area might be right. 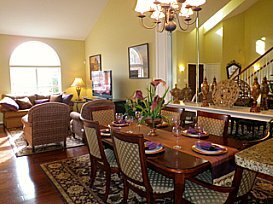 In addition to the quaint shops and restaurants in the many historic towns dotting this road, there is plenty of big time modern-day shopping and restaurants at such places as the Golden Mile in Frederick just ten to fifteen minutes away. And, of course, Washington DC, is within an hour's drive. Most residents have a connection to the area but may come as far as Baltimore or DC. As in most active retirement communities, some residents work and some are retired. 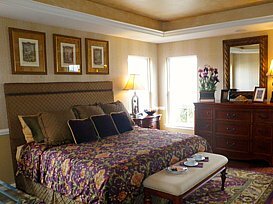 Berkeley Springs, another historic town, famous for its spa, is very close to Hagerstown. The first community we saw was Legacy at Greenview in New Market by Ryan Homes. These are villas and single homes--233 homes. 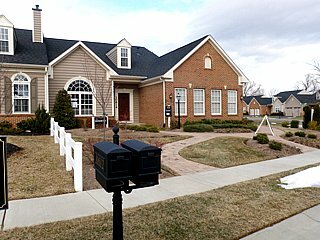 Villas start in low $200,000's and singles upper $200,000's. Very active with interest groups, Clubhouse activities, outdoor pool and tennis courts. For golfers, there are eight golf courses in the area including Holly Hills Country Club nearby. There are two detached floor plans and 2 attached. The 2 bedroom plans are detached homes. The villas are either 2 or 4 attached. 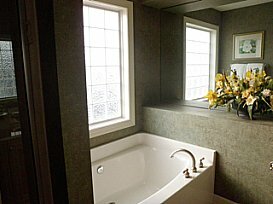 A finished basement, fireplaces and decks are optional. There are many outstanding options. The model floor plan has a first-floor master suite with an option for adding a library/study. There are 2 bedrooms in the upstairs loft. The price was $269,900 without any selected options. (verify as prices change.) It was shown with approximately 2500 SF due to the added-on room options in the model so you can see the possibilities. There are also smaller square footage homes at lower pricing. Condo fee is currently $300/month (please verify information). Please Note: Options are shown in the photos and not all features are included in all models. 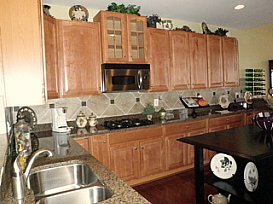 This model had a very open floor plan with dining room blending into living room--easily accessible for comfortable senior living. First-floor master bedroom with walk-in closet. 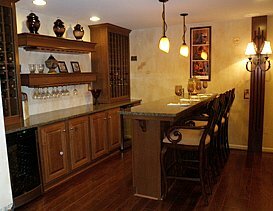 What a treat to see a nicely finished basement--this one showed a wine storage area, bar, and family room with fireplace. This community featured clubhouse, pool and tennis court amenities. Please verify all information with builder. Now sold out but more coming. Check with builder. The next community we saw, also easily accessible from Highway 70, was The Village at Foxfield by Admar Custom Homes on Layla Drive. This is a more custom, smaller builder. This is a community of only 81 homes. It is the age-restricted development within Greenview, located in the town of Middletown. There are non-age-restricted developments also which makes it seem larger. The community feels very open and spacious with wonderful hill views. Very nice for retirement in Frederick Maryland. These homes started in the upper $200,000's. There is a very small homeowner's fee because the residents chose to not have a clubhouse or pool, although there are pools in the area. This is an extremely socially active community with a newsletter and many opportunities to make new friends. Game night, potluck dinner, and many more, both quaint and contemporary. 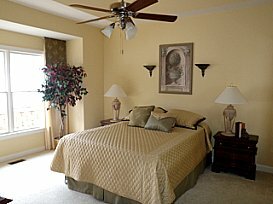 There are a variety of floor plans with optional basements and lofts. 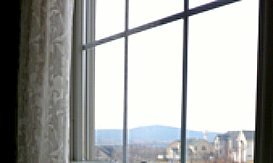 Lace curtains at the window seemed very appropriate here and many wonderful views of hills throughout the community. casual eating area in kitchen. The openness and country views were amazing. The community--casually elegant. Price starting in the low $200's. This community still has some available homes. 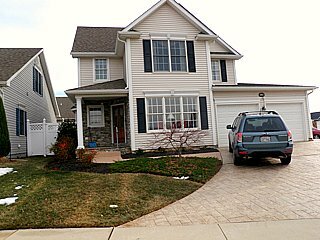 17996 Constitution Circle, Hagerstown, Md. It is easy to see both of our reviewed communities for Retirement Frederick Maryland within a couple of hours.